I was reading the other day about the short list for the National Portrait Gallery – 2014 BP Award. Apparently the judges, who decide on which works should be shortlisted, are not aware of the names of the artists when they make their selections. For the first time in the twenty-five years of the competition, two of the portraits selected for the exhibition were works by a husband and wife, Henrietta Graham and Tim Hall and it made me wonder how well husband and wife artists co-exist and whether they were supportive of each other’s artistic efforts and style or were they occasionally critical and somewhat jealous of each other’s success. My featured artist today was one half of a husband and wife duo but it is thought that the husband became so critical of his wife’s works and her style of painting that she eventually gave up art altogether. The lady in question was born Marie Anne Caroline Quivoron in December 1840 in the small picturesque coastal village of Argenton-en-Landunvez, on the Brittany coast. 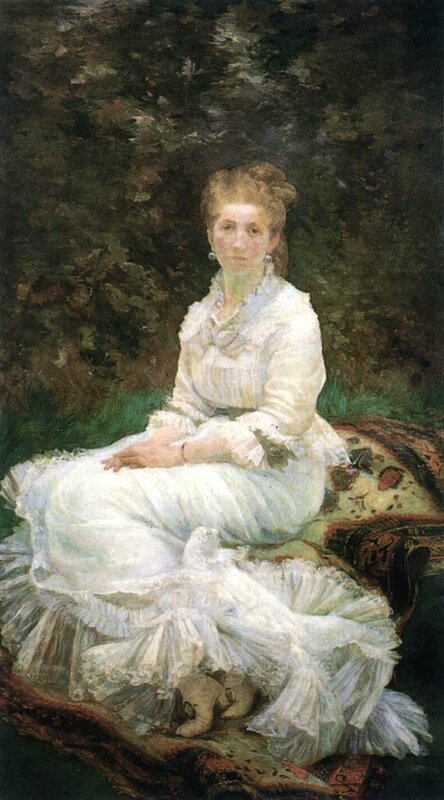 She was of the same era as her female Impressionist contemporaries, Berthe Morisot, Mary Cassatt and Eva Gonzalez but her background was very unlike their more privileged and cultured upbringing. Her mother’s first marriage was an arranged one to a sea captain. It was neither a successful nor happy union. However, it did not last long as he died shortly after the birth of his daughter, Marie Anne. Her mother was only a widow for a short period before marrying for a second time. Her husband was a Monsieur Pasquiou. Shortly after this second marriage, Marie, her mother and her mother’s new husband moved away from Britanny and went to live in the Jura, a mountainous region in the east of the country. Then, soon after, they crossed over the border to take up residence in Switzerland. Again their stay was short-lived and before long they moved back to central France and settled in Corrèze in the Auvergne, where Marie’s sister, Louise, was born. According to what she told her son in later life, this was the happiest time of her childhood. They lived in a area surrounded by mysterious forests, fast-flowing streams and ancient ruined abbeys. Living there was a truly magical time for her. The family finally moved north and settled in Paris but later because of Marie’s health problems they were advised by the family physician, Doctor Hache, to move out of the polluted atmosphere of the city and settle in Étampes, a small town south-west of the capital where the air would be purer. Now a teenager, Marie developed a love for art and it was whilst living in Étampes that she received her first artistic tuition. Her teacher was a Monsieur Wassor, an elderly man who gave art lessons to the young women of Étampes as well as earning money as an art restorer. He got Marie to make copies of reliefs and plaster casts which he had scattered around his studio and he also got her to make copies of paintings he had accumulated. When the summer came and the weather improved he would take Marie and other students outside to paint en plein air. Her progress as an accomplished artist was swift and a measure of that is the fact at the age of seventeen she submitted a family portrait, which included her mother, her sister Louise and one of her elderly teachers, for inclusion at the 1857 Salon and it was accepted. Her artistic ability must have been well known as she soon received commissions including one from the court of Empress Eugenie, the Empress of France and wife of Napoleon III, which commissioned a depiction Cervantes in prison. Following the successful conclusion of this commission she was approached by the Director-General of French Museums, Count de Nieuwerkerke, to work at the Louvre, making copies of the most famous paintings in the collection. It was in 1867, whilst Marie was working in the Louvre copying a painting by Rembrandt, that a young man, Félix Bracquemond, an engraver and etcher, first caught sight and fell in love with this dark-haired beauty. 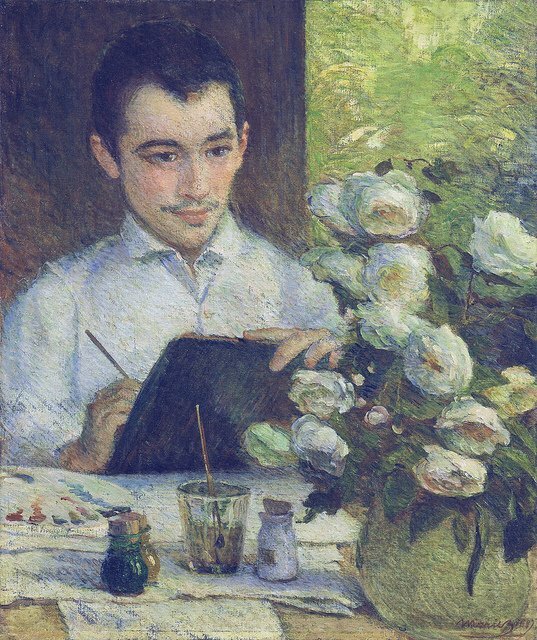 Félix, through his friend, Eugène Montrosier, was introduced to Marie. A two-year courtship followed during which time Félix introduced Marie to all his artist friends, such as Millet, Corot, Degas, Rodin and Fantin-Latour and art critics and writers such as Edmond de Goncourt and Gustave Geffroy, and through them she received more and more commissions. Unfortunately for Marie there was a problematic downside to this relationship. Félix was not a particularly nice man. He had a very off-hand brusque demeanour. He was self-opinionated and later became über-critical of Marie’s artistic talent but despite Marie’s mother’s voiced concern over the relationship between Félix and her daughter, the couple were married in August 1869 and went to live in the rue de l’Université in Paris. Marie was well aware of her husband’s unacceptable characteristics but presumably believed that all that would change when they were married. It didn’t! 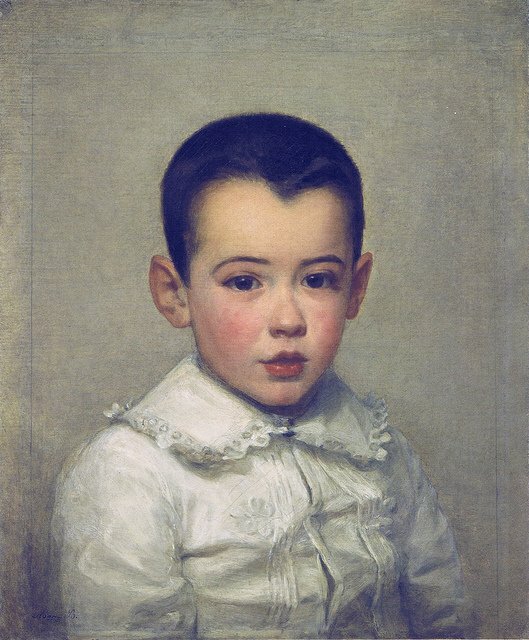 In 1870 Marie gave birth to their only child, Pierre. 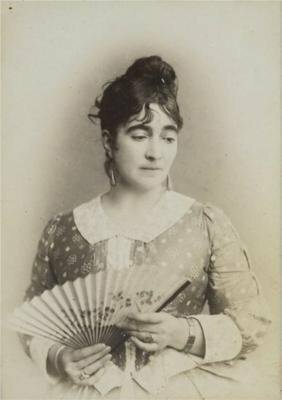 Despite his uncompromising and offhand attitude Marie learnt a great deal from her husband and she exhibited works at the 1874 and 1875 Salon. Faience is the conventional name in English for a tin-glazed earthenware. One of Marie’s great accomplishments was to design and produce several dishes and a wide Faience panel of ceramic tiles entitled the Muses, all of which were exhibited at the Exposition Universelle in Paris in 1878; the preliminary sketch used for the design was shown at the Impressionist Exhibition of 1879 and among its greatest admirers was Edgar Degas. It was around 1880 that there was a change in Marie’s artistic style. Gone were the small muted works of art and in their place came larger works with a greater intensity of colour and more of her paintings were carried out en plein air allowing her to catch the nuances of the daylight which constantly changed.. This was the era of the Impressionists and Marie Bracquemond had become great friends of Edgar Degas, Claude Monet, Renoir and Gaugin these artists had become her artistic mentors. She had been welcomed into the Impressionists’ fold and she exhibited works at three of their annual exhibitions, in 1879, 1880 and the final Impressionist Exhibition in 1886. 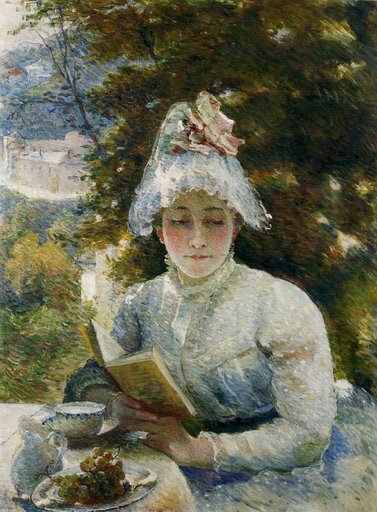 Three of her works completed in 1880 which clearly demonstrate her alteration of style to a noticeable Impressionist style, were The Lady in White, On the Terrace at Sèvres and Le Gouter (Afternoon Tea). 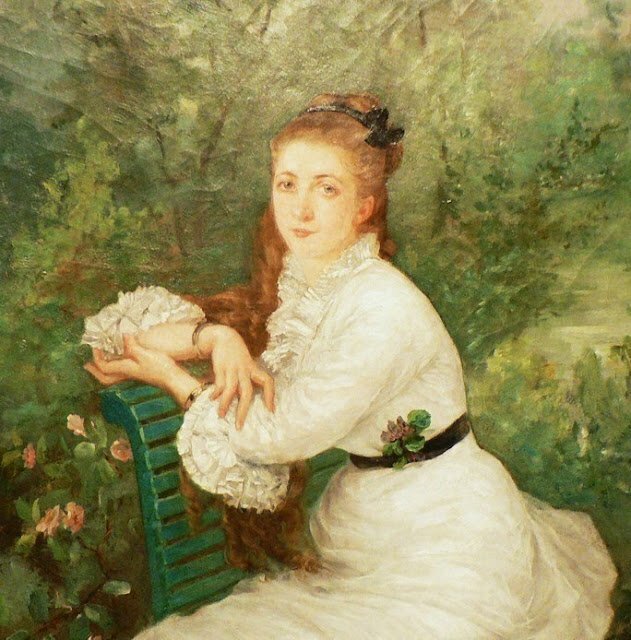 She was delighted with her art and its popularity but this delight was not shared by her husband, Félix, who resented her success and her close liaison with the Impressionists. Their son Pierre, who loved his mother and was the No.1 fan of her work, later wrote about his father’s resentment. 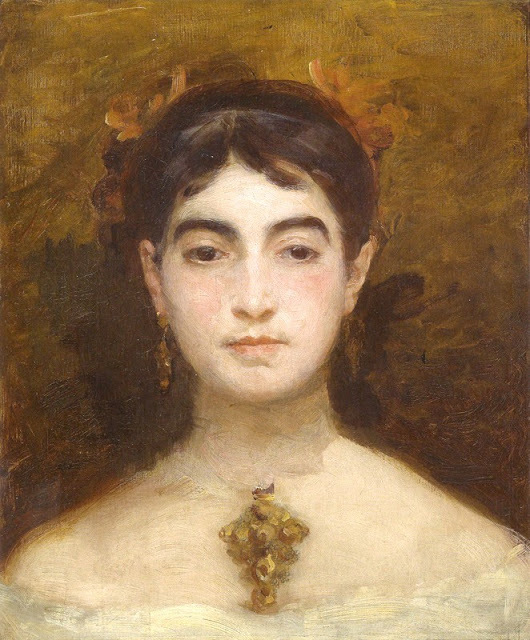 According to Pierre, Félix was jealous of her achievement and rarely showed her works to visiting artists and friends. He said that Félix now resented any criticisms Marie might venture about his paintings. 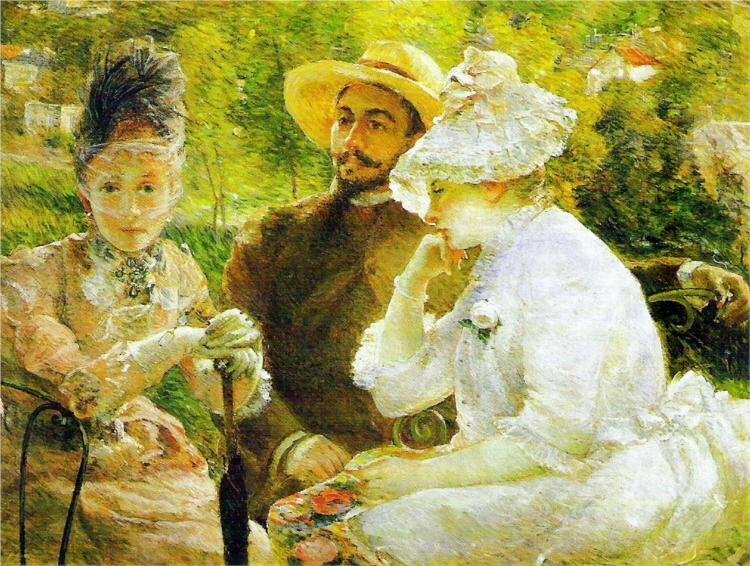 It appeared that the once close artistic relationship between Marie and Félix, with each offering constructive critiques regarding their works, was over. Félix would often hide his new works from his wife but at the same time was openly critical with regards to her artistic efforts. 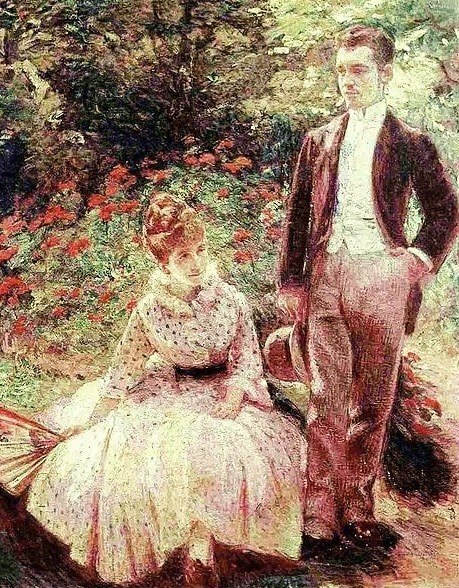 This uncomfortable atmosphere in the marital home and the constant friction between her and Félix finally took its toll in 1890 when Marie could not stand her husband’s attitude to her work any longer and except for a few examples completely gave up her painting. One of her last works was the Impressionist-style work entitled The Artist’s Son and Sister in the Garden at Sèvres which she completed in 1890. At the time of this painting the constant battle with her husband had made her become introverted and she became a virtual recluse, rarely leaving their Sèvres home. Her sister Louise did not like her brother-in-law finding him overbearing and boorish in the way he treated her sister. Pierre Bracquemond who was taught by his father later became involved in works for Gobelin, a Parisian tapestry factory. He then worked at a career as an interior decorator specialising in the designs of carpets and tapestries. He also carried on his love of art concentrating on seascapes and nudes, chiefly employing the technique of encaustic paintiing, which was also known as hot wax painting, as it involved using heated beeswax to which colored pigments were added. He also wrote many critiques with regards art and the teachings of his father on the subject. There were also many manuscripts he had written about his parents Marie and Félix, some of which were never published. Marie Bracquemond died in Paris on January 17, 1916. My featured artist today would often bring into play the tenebrism style in his works of art. The term tenebrism comes from the Italian word tenebroso, meaning dark or gloomy and figuratively can be translated as “mysterious” and is a word used to primarily describe dark tonality in a work of art. Tenebrism was developed to add a sense of drama to an image through a spotlight effect. Tenebrist works of art first came on the scene in Rome around 1600 and some of the earliest examples were by Caravaggio. The dark backgrounds to his works and the shadows cast across the subjects of his painting where in complete contrast to small areas of light, often from an unidentified source, which lit up part of the main depiction. Caravaggio’s tenebrist style was taken up by a number of his Italian contemporaries such as the father and daughter painters Orazio and Artemisia Gentileschi and the great Dutch Master, Rembrandt von Rijn. Many of the artists from outside Italy who came to Rome and Naples to study art also experimented with tenebrism. 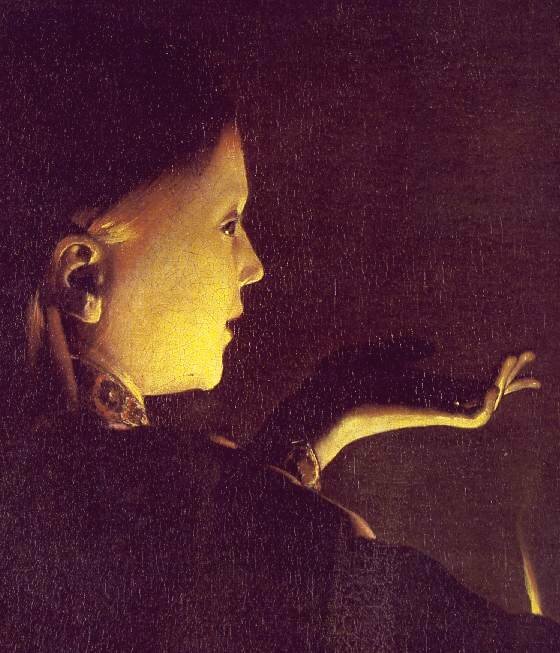 Georges de la Tour was a masterful exponent of this style of painting. In some ways his tenebrist style was slightly different from that of Caravaggio in as much as he would often include the source of light in his painting. Although Georges de La Tour spent his entire artistic career in provincial France, far from cosmopolitan centers and artistic influences, he developed a poignant style as profound as the most illustrious painters of his day. In his lifetime his work appeared in the prominent royal collections of Europe. La Tour’s early training is still a matter for speculation, but in the province of Lorraine he encountered the artist Jean Le Clerc, a follower of the Italian painter Caravaggio. 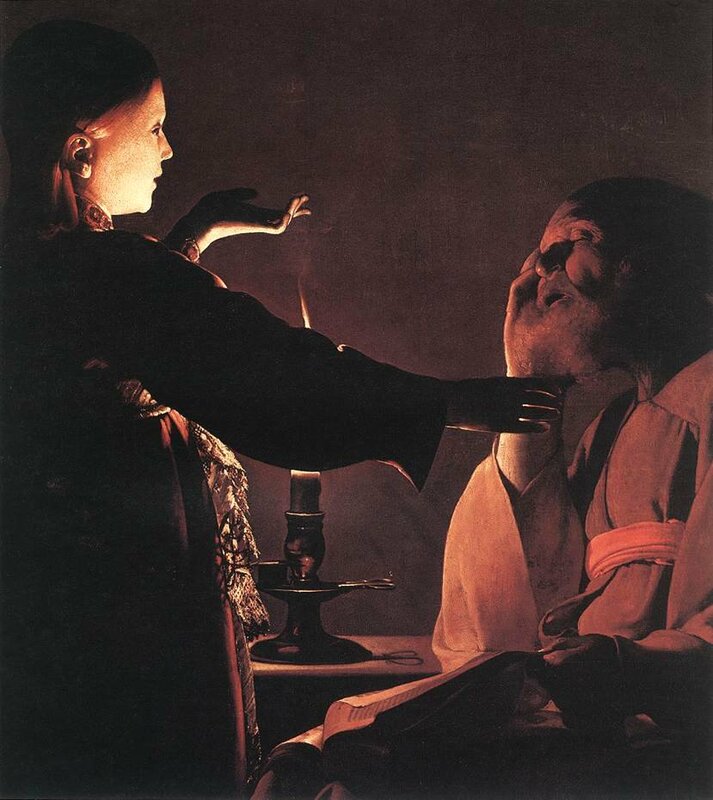 One great example of Georges de la Tour’s tenebrist style can be seen in his work entitled Magdalene with the Smoking Flame which Georges De La Tour, completed in 1640 and which can now be found in the Los Angeles County Museum of Art. In this work we see a depiction of Mary Magdalen, not as an aged woman living a hermit-style life in her grotto, but as a contemplative young woman. This is a depiction of a vivacious young woman who sought the pleasures of the flesh in her early days. Her arms and legs are bare. There is a sense of melancholia and loneliness about her demeanour. She sits with her left elbow resting on the table with her hand supporting her chin as she gazes fixedly at the burning flame. Maybe she is mentally examining her past life. Look how the artist has managed to achieve differing textures which have been brought to life by the light of the candle. Observe the textural difference between her heavy red skirt and thin white, wrinkled blouse which contrasts with the blemish-free smoothness of Magdalene’s flesh. On her knees rests a skull which is always looked upon as symbolising our own mortality and the inevitability of death. On the table there are books of Scripture, a wooden cross and a leather scourge which alludes to Christ’s suffering and his eventual crucifixion. These latter two items add to the sombre mood of the work. However, besides Magdalene, the main subject of the work is the oil lamp which smokes and emits the light that brings a modicum of luminosity to the dark painting. Flame from a candle is often looked upon as symbolising enlightenment and purification but in this depiction there is a smoky element to the flame which may lead us to believe that enlightenment and purification of Magdalene’s mind and soul are not yet complete. Although our eyes too are drawn to the candle we should look at other aspects of the work and see the mastery of the artist in the way he depicts the various textures. We have the well-polished skull and the leather cover of the books both of which reflect the candlelight. Another haunting work of Georges de la Tour in his tenebrist style is Christ in the Carpenters Shop, completed in 1645 and which hangs in the Musée du Louvre, Paris. It is a depiction of Joseph, a descendant of the house of David, husband of Mary and “foster father” to Christ, who was a carpenter in Jerusalem. 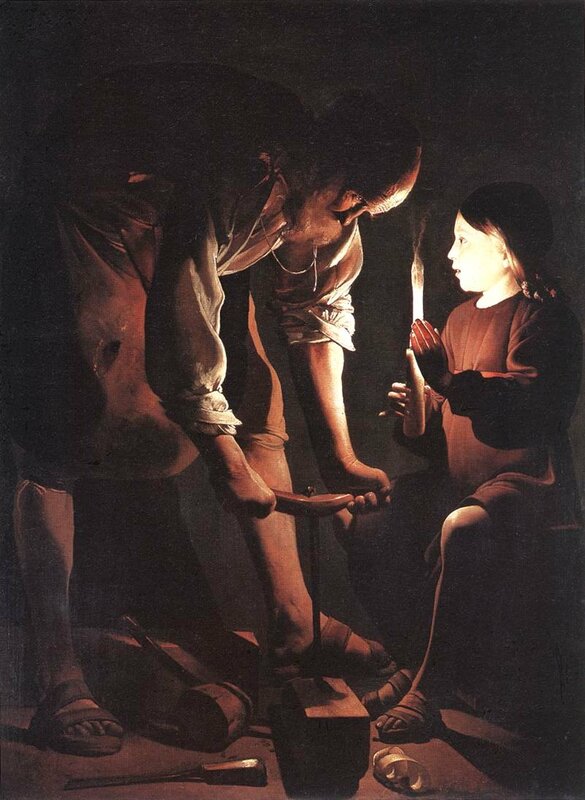 In Georges de la Tour’s depiction we see Joseph leaning forward, busy drilling a hole in a block of wood with his auger, the shape of which mirrors the shape of a cross. He is in his workshop watched over by Jesus whose face radiates in the large frame. Once again the depiction of the two characters is swathed in darkness with only their faces and upper bodies lit up by the flame of the candle held by the boy. The contrast between the two figures is striking. The bearded Joseph, a large hulk of a man, is bent over towards his young helper in an almost threatening stance brought upon by the physical exertion of working the auger. In total contrast Jesus is depicted as gentle youngster watching Joseph’s every move. The candlelight illuminates the young face of Jesus. There is purity and innocence in the way the artist has depicted the face of Jesus. What is also fascinating about the depiction of the young Christ is the way de la Tour has depicted the luminescence of Jesus’ left hand which is shielding the flame. Although this is probably looked upon as a religious work because of its title, it could well have been a simple genre piece looking with strong realism at a young boy watching his father at work. If we look at the floor, on which we see carpenter’s tools, a wooden ladle and a curled wood shaving. It could almost be deemed as an excellent still-life work. We are not sure as to which of the dreams is depicted in this painting and it matters not. However some art historians who have researched the works of de la Tour have offered a different reasoning behind the work claiming that in early art catalogues the painting had a much simpler title, An Old Man Asleep, Woken by a Girl Carrying a Candle. So is this a religious or secular work? In the painting we see two people, an old man and a child. The old man on the right is seated next to a small table. His eyes are closed. His mouth is slightly open. He is asleep and possibly lost in a dream world. His right elbow rests on the table and his head is resting in his right hand. On his lap we see an open book with the fingers of his left hand still lightly gripping a page. Standing in front of him is a child, probably a girl, dressed in the garb of a biblical character. She stares at the sleeping man and has her arms outstretched in a prayer-like manner. There is something strange about her posture. It is almost as if she is casting a spell over the sleeping man. It is simply a depiction of a man and a child. There are no sign of halos on the head of the child signifying her as an angel and so one can understand why some people cast doubts on the biblical connotation of the work. What fascinates me about this work of art is the tenebrist style Georges de la Tour has used in his lighting of the depiction. The light from the candle flickers and is partially hidden by the one of the girl’s outstretched arms but it still manages to light up her face in a haunting manner. She becomes apparition-like which of course lends to the idea that she is in the old man’s dream. Once again, as in the last painting the girl’s fingertips become translucent and the page held in the man’s hand is illuminated. It is a fascinating work and I will leave you to decide whether you believe it is a religious work and hence it’s current title or whether it is simply a secular work of art and hence its original title. There can be no such doubt with regards to my final featured work by Georges de la Tour. The birth of Jesus and the presence of shepherds is a religious scene which has been depicted numerous times by different artists. This painting, Adoration of the Shepherds, was completed by Georges de la Tour around 1644 and can now be found in the Louvre. The first thing we notice about this work is the amazing candlelight illumination which is associated with tenebrism. As we look at the work we feel the tranquillity and contemplative mood of those around the newborn baby. Mary is to the left of the painting, her hands clasped in prayer. Opposite her is the elderly bearded figure of Joseph. He holds a lit candle in his right hand whilst his left hand guards the flame from being extinguished. Once again, as seen in previous works, the light from the candle filters through between the fingers of his hand. His depiction of the visiting shepherds is a triumph of realism. They crowd around the crib with their presents. The one holding a staff has brought a sheep. The one next to him, slightly in the background has brought a flute, which he clutches to his chest and the shepherdess, or it could be a serving girl, has come with food in the shape of a covered terrine. Next to the crib the lamb chews at an ear of corn which is providing bedding for the infant. There is a simplicity to this scene and this could well be due to the omission of the wealthy trio of visiting kings, dressed in their fine clothes, and holding their expensive gifts which are often included in depictions of the baby in the manger paintings. 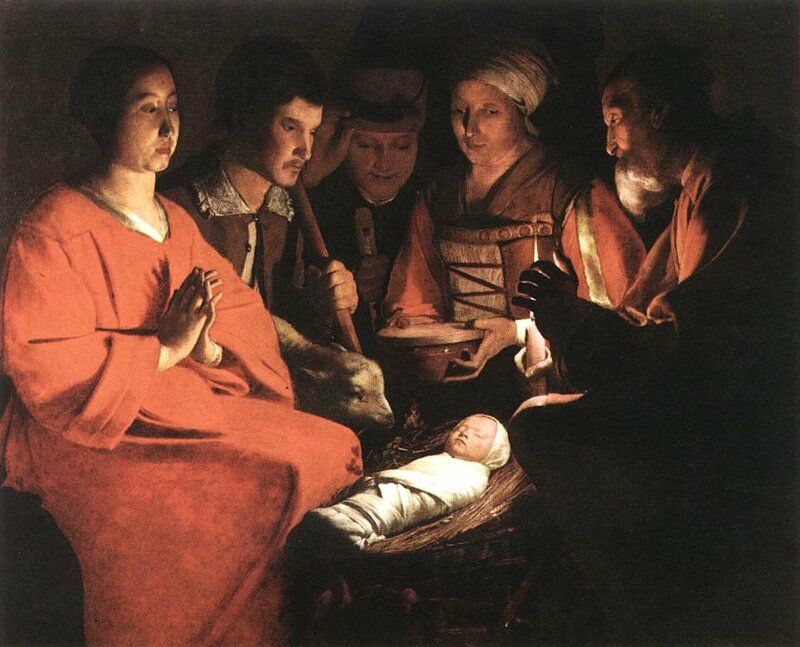 It is thought that Georges de la Tour’s depiction emanates from the Christmas tradition when villagers dressed up as shepherds and shepherdesses to re-enact the Nativity scene and this premise is borne out by the way he has depicted the shepherds in fine contemporary clothing which is in contrast to the plain red gown worn by Mary. Note the small shadow cast by the candlelight on her gown. It is of a trèfle or trefoil, a three-leaved plant, which is part of the crib bedding and is probably a symbolic reference to the Holy Trinity. In this and my previous blog I have featured two distinct types of paintings by Georges de la Tour and I will leave you decide which you prefer. 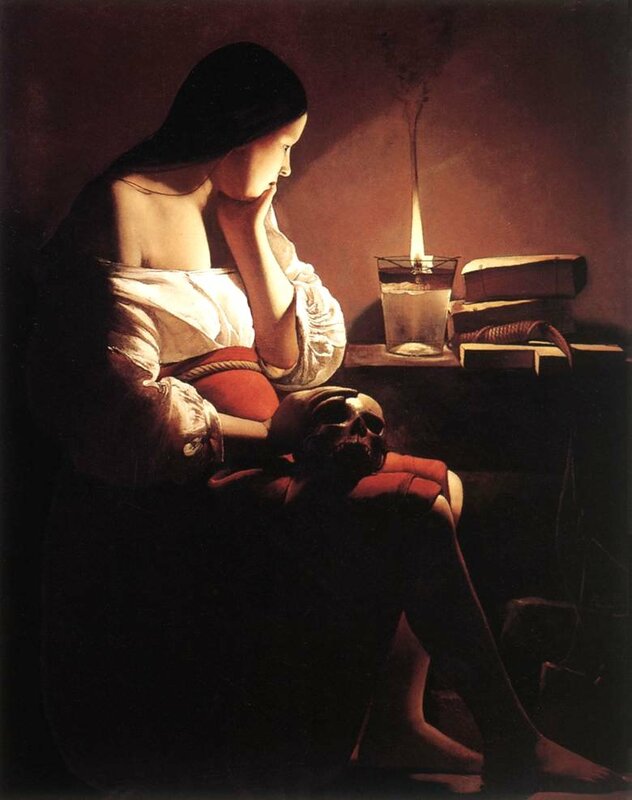 In my next two blogs I am looking at the life of the seventeenth century French artist, Georges de la Tour and featuring some of his works of art. In this first blog I want to feature some of his genre paintings and in the second blog I will look at how he, like Caravaggio before him, was a master of tenebrism. Georges de la Tour was born in 1593 in Vic-sur-Seille, a small town in the department of Lorraine in north-eastern France but which, at the time, was part of the Holy Roman Empire. He was one of seven children born to his father Jean, a baker and mother Sybille. Details of his early life are sparse but we know he married Diane le Nerf when he was twenty-four and they went on to have ten children. Three years after marrying the couple moved to Lunéville, which was his wife’s home town, and was also just a short distance from Georges’ birthplace. It was here that he spent the rest of his life. He had quite a successful career and his paintings were bought by the likes of King Louis XIII, Cardinal Richelieu and the Duke of Lorraine whom he worked for between 1639 and 1642. He died in 1652 just short of his fifty-ninth birthday. 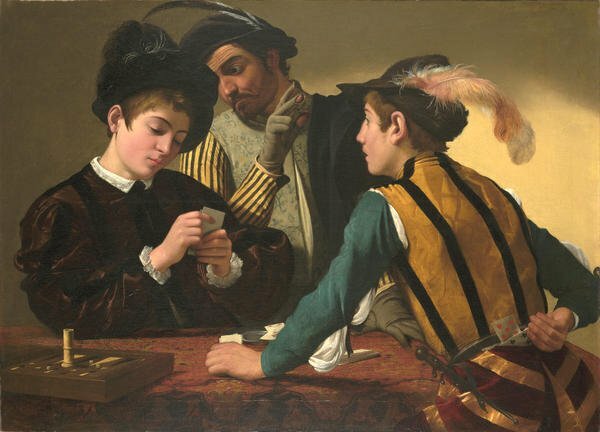 Paintings featuring card players, and the perils of being cheated of your winnings, were not an unusual subject and one of the most famous was completed around 1594 by Caravaggio. It was entitled The Cardsharps and now hangs in the Kimbell Art Museum in Fort Worth. The boy on the right is the “cheater” and his older accomplice in the middle is giving him signs as to the cards held by his opponent. 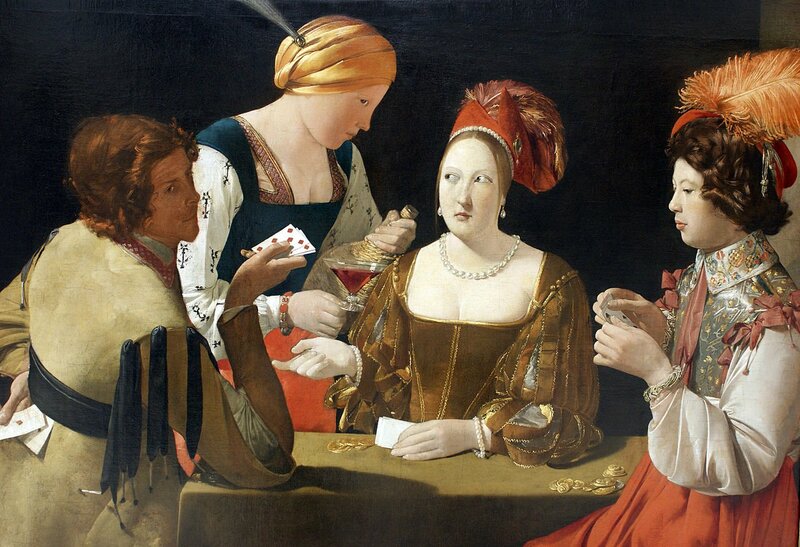 The first of the Georges de la Tour paintings I want to showcase is one entitled Le Tricheur à l’as de carreau or The Cheat with the Ace of Diamonds which he completed around 1635 and is now to be found in the Louvre. It is easy to see the similarity between this painting and the one painted forty years earlier by the Italian Master. This seventeenth century work was put on show at the 1934 exhibition at the Musée de l’Orangerie in Paris entitled The Painters of Reality in France in the seventeenth century and it was through this memorable exhibition that French 17th century art was brought back to prominence and works by Georges de la Tour, who had almost been forgotten by French art lovers, once again became popular and his works following the exhibition were in great demand. The first thing we must decide on is what is going on. On the right is a man dressed in the most expensive clothes carefully studying his hand of cards. There is something about his appearance which makes us believe that he is slightly naive as his conspirators exchange sidelong glances. He is slightly set apart from the other three characters. Is he there at his own volition or has he been seduced into coming to the gambling den by the courtesan who sits next to him? In a way it is a painting with a moral. It is a depiction of a man who has to withstand three great inducements. He has to withstand the temptations of lust brought on by the presence of the courtesan and serving maid, the temptation of alcohol which is being handed out to the card players and of course he has to resist the vice of gambling French moral standards of the time frowned upon the three vices. However he has put his moral standards to one side and for that, we know, by what we see happening before us, will be his undoing. The courtesan is centre stage in the painting. On the table by her is a small pile of money. It is not as large as that of the guests but that will soon change. Her clothes are sumptuous. The plunging neckline of her costume no doubt titillates her male guest and probably distracts him from his game. Her hair is topped by a fancy and fashionable feathered headdress. Look at her eyes. They are shifty. Her whole expression, her whole demeanour, is one of deceitfulness. Her right hand points to her co-conspirator probably advising him to play his hand. We see him retrieving the ace of diamonds from under his belt, which will complete his winning hand. The serving wench brings wine to the table and she too has a deceitful look about her as she casts a sidelong glance at the “mark”. She knows what is going on. She is part of the conspiracy. The man, who is slightly in shadow and who is retrieving the ace of diamond looks out at us. We have been drawn into this plot. It is as if now we are also co-conspirators. 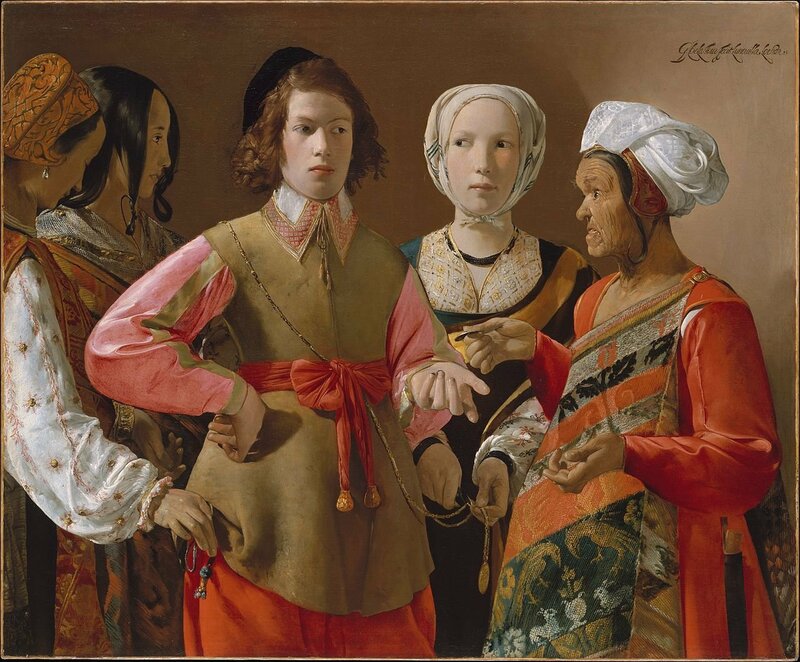 A copy of this work which Georges de la Tour completed later can be found at the Kimbell Art Museum in Fort Worth Texas, the same gallery which owns the Caravaggio painting, Cheaters. This painting is entitled Cheat with Ace of Clubs and once again is a moralistic painting warning people against the vices of lust, excess wine and gambling. Like the painting in the Louvre the characters are the same, the shifty looks of the deceivers are the same it is just the suit of cards has changed from diamonds to clubs. 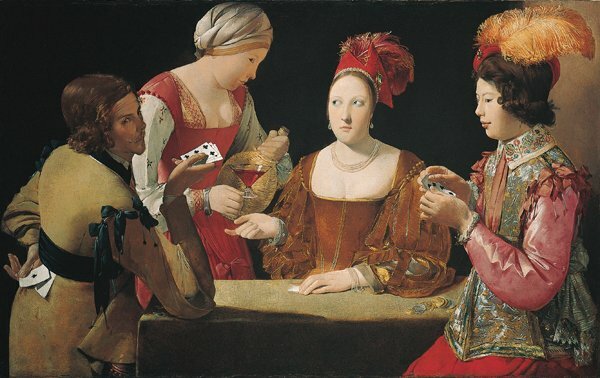 Four years before Georges de la Tour embarked on the theme of cheating at cards he focused on another piece of skulduggery – pick-pockets and con-artists. The work in question was known as The Fortune Teller which he completed during the 1630’s and can now be found in the Metropolitan Museum of Art in New York. In this work we see a naive young man standing between two young women. He is well dressed and one is given the impression that he is also wealthy and ideal rich picking for the pick-pocket. To the right of the painting is the wrinkle-skinned old crone who purports to be a fortune teller and has extracted a silver coin from the young man as payment for her telling him his fortune. She is about to take the coin from his hand, and as part of the gypsy fortune-teller ritual, she will then cross his palm with it. She, like the three younger women, are colourfully dressed and portrayed as gypsies. As is often the case, even in today’s time, gypsies are pictorially portrayed in this work of art as thieves. The crime is clearly there for us to witness as whilst the young man is engrossed in what the fortune teller has to say and at the same time as he hands over his fee the young lady on the right of the painting delicately removes the coin purse from the pocket. However that is not all the young man is about to lose. Look at the young woman between the fortune teller and the man. She is more soberly dressed. Look what she is doing with her hands. She is just about to cut the gold medallion from its chain which is around the young man’s neck and right shoulder. I like the way her eyes are fixed on his face in order to see if he is aware of what she was doing. My final featured paintings by Georges de la Tour move away from the group genre scenes with the accompanying moral tale and focus on single portraits. These are really exquisite works of art. The subject of the next work of art is an elderly blind beggar and street musician trying to eke out a meagre living by playing a hurdy-gurdy. The hurdy-gurdy was the first stringed instrument to which the keyboard principle was applied. In France it was known as Viella a Roue , which literally translates to wheel fiddle and which describes the method by which sound is produced. The bowing action of the fiddle is replaced by a wheel cranked by a handle. The outer rim of the wooden wheel is coated with resin. When the crank is spun, the wheel turns and the gut strings vibrate. The player of such an instrument was known as a vielleur. 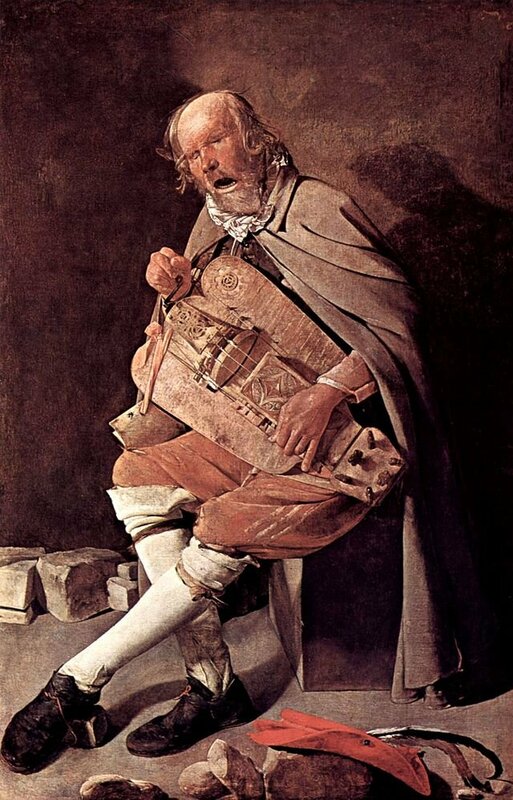 Georges de la Tour often painted several variations on the same subjects, and the depiction of a street musician was an example of this. 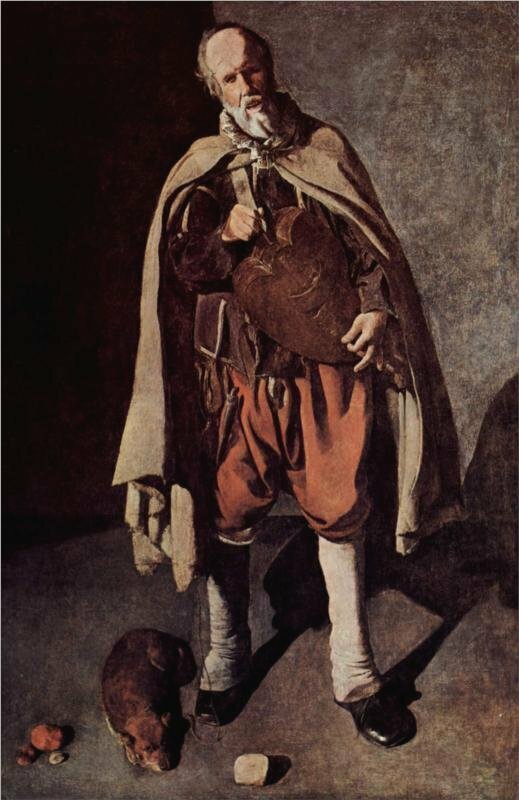 He painted the one shown above, entitled The Blind Hurdy-Gurdy Player, around 1630 and it can now be found in the Prado, Madrid. The man is depicted in profile and, but for the title of the work, one would never have known that he was blind, although his eyes are closed. He has a trouble-worn face and his forehead is heavily wrinkled. His skin is swarthy from spending most of his time out on the streets. He wears a thick grey-brown coat with a white lace ruff. Look how the artist has spent time on depicting the texture of the musical instrument. Another version of this work can be seen in the Musée des Beaux-Arts, Nantes in France. 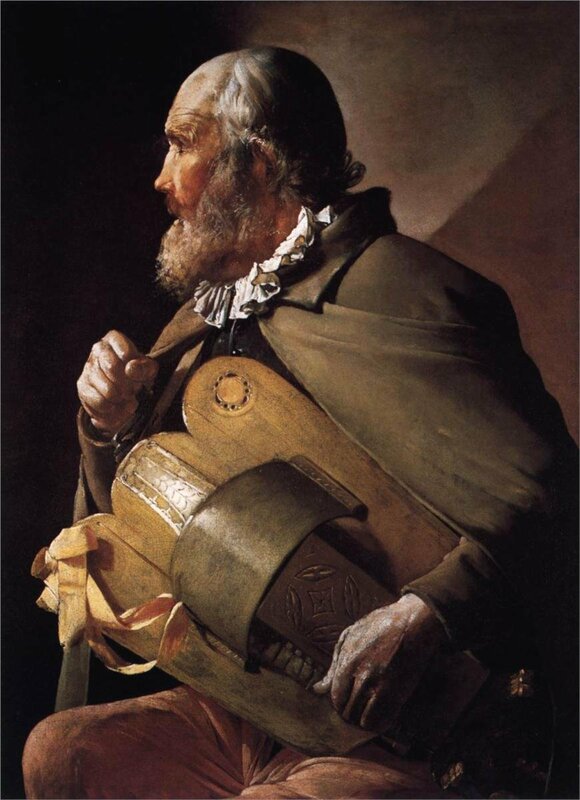 This work entitled The Hurdy-Gurdy Player was also completed by de la Tour around 1630. This is a more unsettling portrait of the beggar. He looks unkempt and uncared for. His facial expression is one of pain and anguish as he sings to the tune he plays on the hurdy-gurdy. He wears the same heavy grey-brown coat with the white scarf or ruff. On the floor in front of him, resting on a large stone, is his bright red hat with a plume of feathers and often this painting is referred to as The Hurdy-Gurdy Player with Hat. An earlier version, around 1625, on the same theme can be found in Bergues, the northern French town, close to the border with Belgium. It is the Musée Municipal Bergues which houses The Hurdy-Gurdy Player with his Dog by Georges de la Tour. In my next blog I will feature some of Georges de la Tour’s tenebrist paintings, a style which had been made popular by Caravaggio. I travel a lot around Europe and during my stays in the various towns and cities I always try and spend some time in the local art galleries. The one thing that I do enjoy, which is not often afforded to me in my own country, is the ability to visit local churches in which, especially in France and Italy, one can find beautiful works of art, frescoes and exquisite altarpieces. In this blog I want to look at one of the great altarpieces of the fifteenth century. It was not a huge work of art destined for a church or cathedral but a small devotional work which was to be placed in a room of a wealthy merchant, who had commissioned the altarpiece. The altarpiece I am referring to is an Annunciation triptych known as the Mérode Altarpiece. The work, which was completed sometime between 1425 and 1428, is now part of the Metropolitan Museum collection in New York and the exquisite and beautiful work is attributed to the early Netherlandish painter, Robert Campin and his workshop assistants. 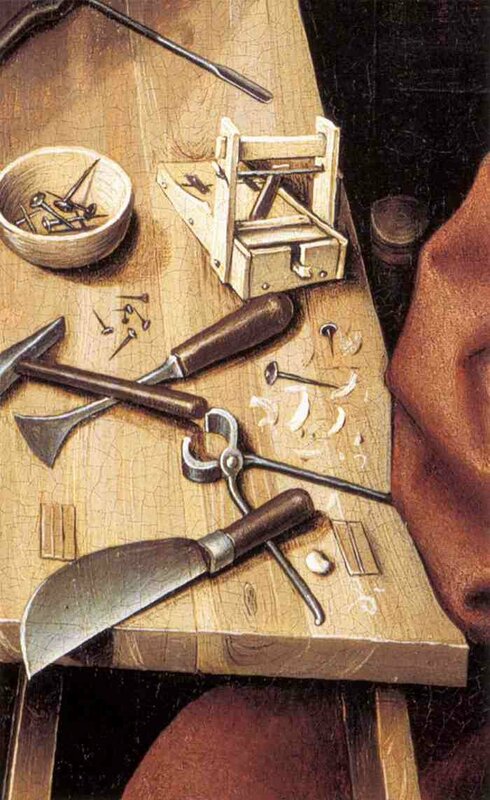 Robert Campin is often referred to the Master of Flémalle. The title “Master of….” was term often used by art historians to attribute an anonymous work or even groups of works. It was a common attribution used in the nineteenth century by German art historians when discussing Early Netherlandish paintings. So how did Campin end up with his title? It is believed that it was due to the fact that three paintings in the Städliches Kunstinstitut in Frankfurt were said to have come from the abbey of Flémalle, a town close to Liège, but have since been attributed to Campin. Robert Campin was born around 1375 but it is not until thirty years later that his name appears in records. It seems that he settled in Tournai, the Walloon town of Belgium. Tournai is unlikely to have been his birthplace as records show that in 1410 he bought citizenship of the town, which he would not have had to do if it had been his birthplace. Some would have us believe he was born in Valenciennes, now a French town bordering Southern Belgium. This assertion is based upon the fact that the name Campin was very common surname at the time in that town. In the records, Campin’s profession was given as a Master Painter and we know he became a free master of the local Corporation of Goldsmiths and Painters and in 1423 became the sub-dean of the society and later held the post of Eswardeur. During his early years at Tournai, Campin worked for the municipality painting banners and he went on to be employed to paint sculptures in various churches, including the town’s Church of St Brice, and a number of municipal buildings, notably the Halle des Doyens in Tournai . This colouring of sculptures was termed polychromy. He had a good working relationship with the local sculptors including the famous sculptor, Jacques de Braibant. Robert Campin was good at what he did and soon he and his work became very popular and he received many commissions. His wealth grew and through his commissions and his investments Campin owned a number of properties in Tournai. His standing in the community was high. He was warden of the church of St Pierre as well as procurator of the Convent of the Haute-Vie. All was going so well for Campin. He was running a large successful workshop and had skilled apprentices including a young painter, Rogier de le Pasture who is believed to be Rogier van der Weyden. So life was good until he got involved in local politics and the disturbances in the city between two political factions. Sadly for him he backed the losing side and for his part in the 1429 disturbances and his reluctance to testify against the leaders of the uprising he was sentenced to go on a pilgrimage to Saint-Gilles in Provence. Such a sentence was common in those days as it was thought that during such a pilgrimage one could think about one’s wrong-doings. The local authorities never forgave Campin for his part in the uprising and for a number of years hounded him. It came to a head three years later, in July 1432. Campin was in trouble again. This time it was because of his adultery. He was married to Ysabiel de Stocquain but at this time was living with another woman, Leurence Polette. The courts took a dim view of this sexual liaison and he was charged with adultery and was once again sentenced to go on a twelve-month pilgrimage. This would have ended his artistic work and the closure of his workshop but this time he was saved from this banishment. His saviour was none other than Margaret of Burgundy, the Countess Dowager of Hinault and the powerful daughter of Philip the Bold and wife of William of Bavaria and his pilgrimage sentence was reduced to a fine. Maybe it was one court appearance too many for after this last incident little was heard of Campin in the archives of Tournai and his lucrative commissions dwindled. 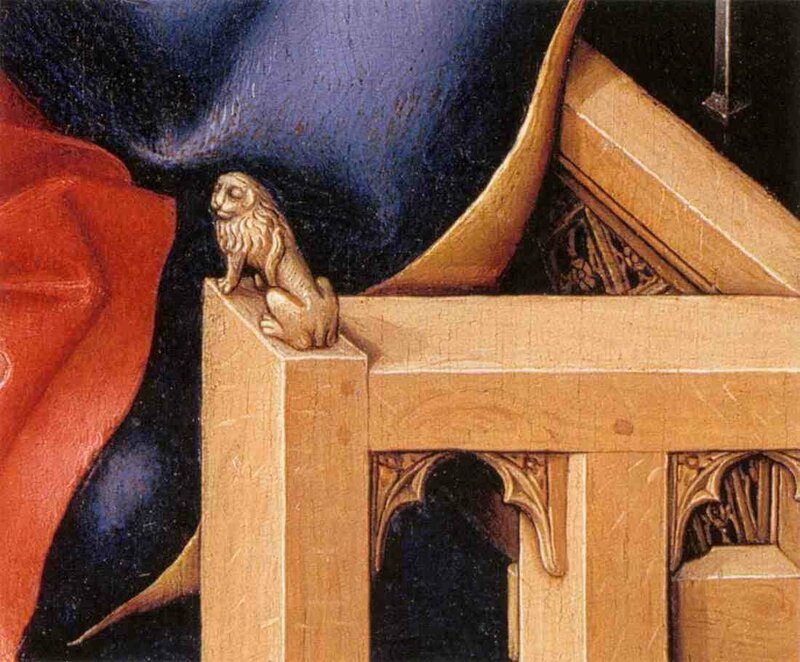 Robert Campin died in Tournai in 1444. And so to the featured work of art by Robert Campin and his workshop assistants, the oil on oak panel entitled The Annunciation Triptych often referred to as The Mérode Altarpiece which was completed around 1432 and is now housed in the Cloisters museum and gardens, a branch of The Metropolitan Museum of Art in New York, which is given over to the art and architecture of medieval Europe that largely date from the twelfth through the fifteenth century. The building and its cloistered gardens are located in Fort Tryon Park in northern Manhattan. Although termed an altarpiece, because of its small size (centre panel is 64cms x 63cms and each wing is just 64cms x 27cms), this was never destined for the altar of a church or cathedral. This was destined for a devotional room in a private house. It is one of Campin’s greatest works. It is thought that originally the painting which comprised of just the central panel was completed around 1430 and then later on the request of the prospective buyer, two hinged wings were added and the work became a devotional triptych. It is also understood that the paintings depicted on the wings were painted by different artists, probably Campin’s assistants at his workshop. The centre panel is a depiction of the Annunciation, which was a common subject for paintings in the fifteenth century. In this depiction Campin has decided the setting of the scene should be a place of domesticity recognisable to people of his time and not set in some palace-like location. The setting is not, as often depicted, the bed chamber of Mary but a living room. Maybe Campin wanted observers of this altarpiece to empathise with Mary and for that she needed to be looked upon as an ordinary young woman – hence no halo! The room is clean and tidy and in some ways defines Mary as a diligent and house-proud female. Look closely at this panel and the first thing which may strike you as being strange is the depiction of Mary. She is sitting on a cushion on the floor and not on the bench to her left. This could be to illustrate her humility. She is totally absorbed in reading a book but is so careful not to dirty the tome by touching it and so she holds it in a white cloth. She is wearing a long red dress and Campin has cleverly depicted the folds of the dress with the light playing on them so that they form a bright white star. 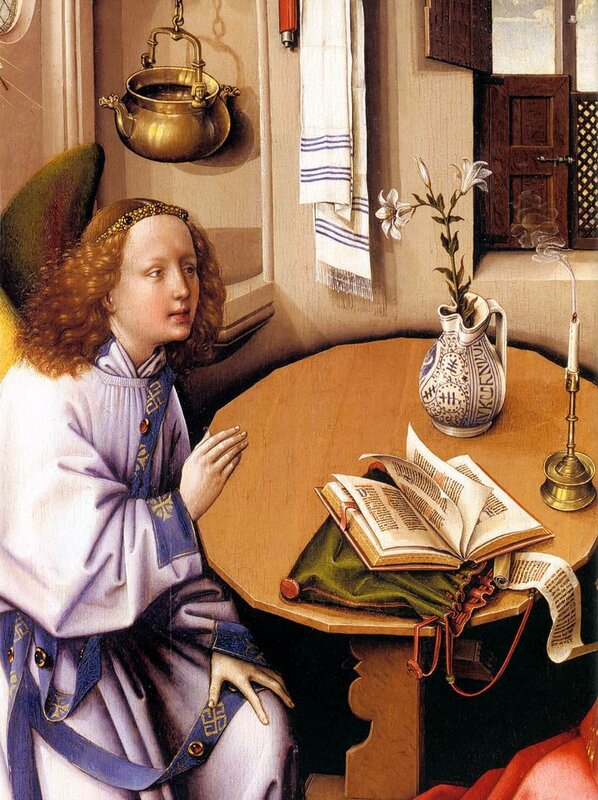 As she sits and reads from her book she seems quite oblivious to the presence of the Angel Gabriel who is to her right dressed in the vestments of a deacon. Between Gabriel and Mary there is a sixteen-sided table which some art historians believe alludes to the sixteen main Hebrew prophets. On the table there is an open book and a scroll, which could have been reference works which were used by Mary as she read her book. The act of reading what was probably a religious work and the presence of a reference book and scroll open on the table portray Mary as a learned and devout woman. We see a highly-polished bronze fifteenth century Flemish candlestick holder with its newly extinguished candle on the table. 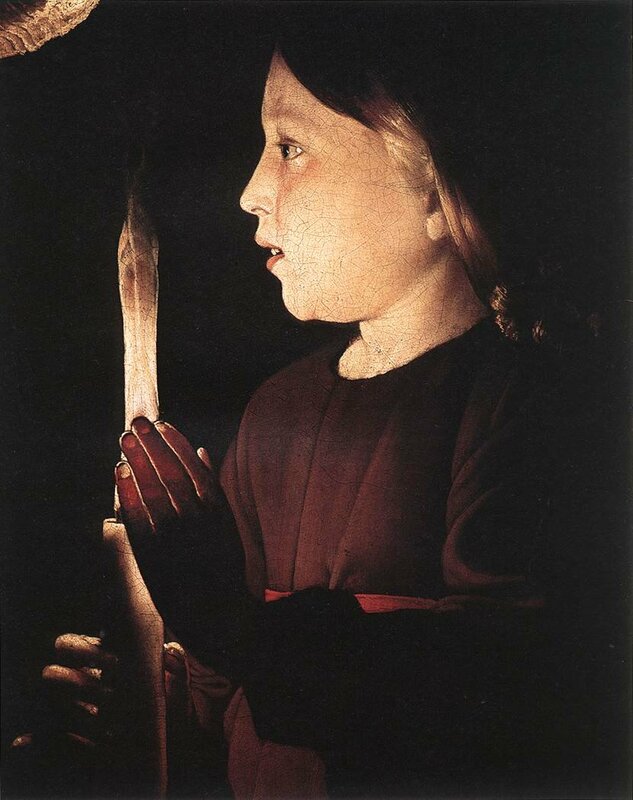 The flame, which had once been present, represented God and now it is gone, to be replaced by the tiny Christ Child which enters the room on the rays of the sun which beam through the window at the left of the painting. It is a symbol of the Incarnation. In the left background we see, hanging in an alcove, a highly polished bronze laver. This was the implement originally used by priests when they washed their hands and feet before entering into and coming out of a holy place. 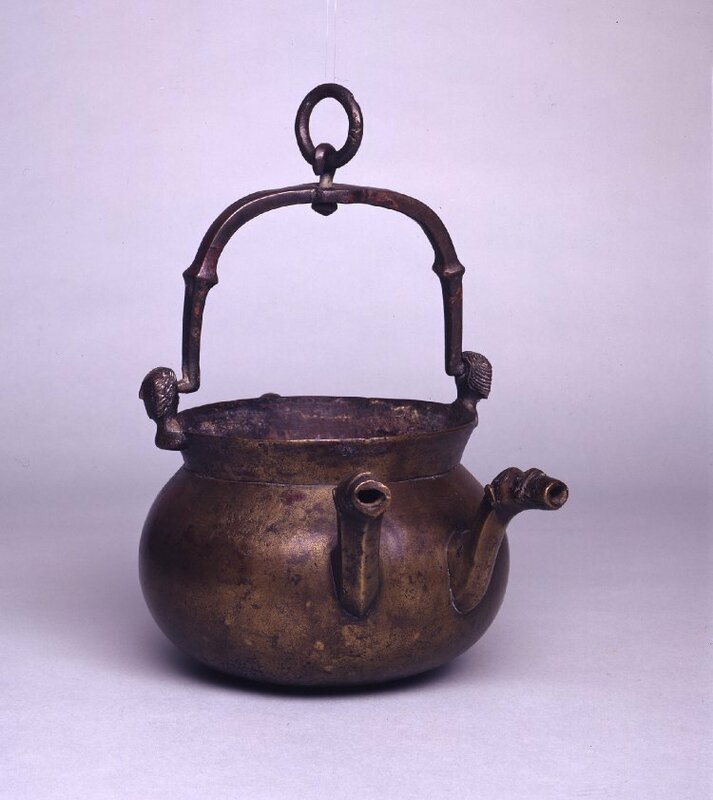 Campin’s depiction is of a 15th century Flemish laver. Once again the highly polished laver and candle holder are testament to Mary being a hard working woman who took pride in her house. The central panel’s Annunciation scene depicts the Angel Gabriel announcing to Mary that she is about to conceive the Christ Child. 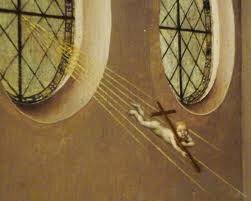 The Holy Spirit, in the form of the Christ Child, which impregnates Mary, appears descending towards Mary on rays of light emanating from the round window to the left of this centre panel. When I first looked at this centre panel I completely missed the small figure of the Christ Child with a wooden cross on his back reminding us of the future crucifixion. So why this inclusion? 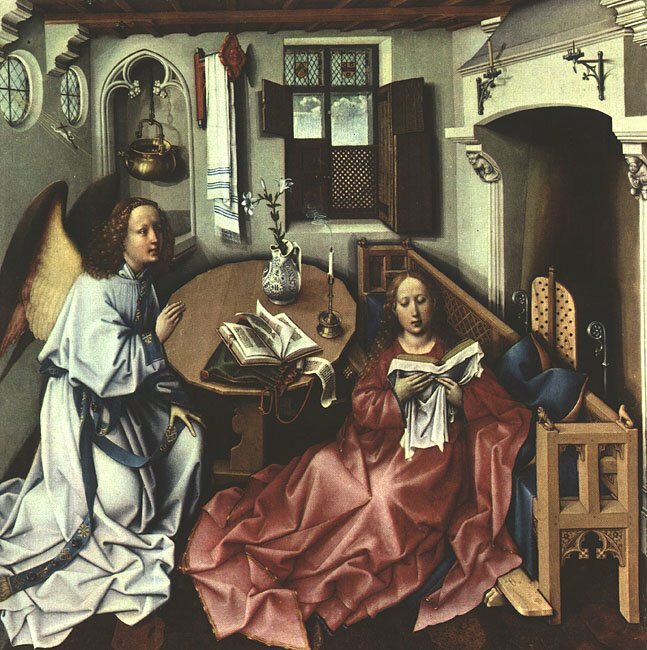 It has been included in this depiction of the Annunciation as what we see before us is also about the Incarnation, the point in time when God becomes man. There are other little pieces of iconography which are easily missed. Look at the bench seat which Mary rests against. Look at the small carved lions on the top of the arms of the bench. These carvings are known as finials and mark the top or end of some object. Some art historians believe that such an inclusion of the finials refers back to the throne of Solomon. These finials have appeared in many paintings – take a look at the top of the arms of the seat in the background of Van Eyck’s Arnolfini Portrait. 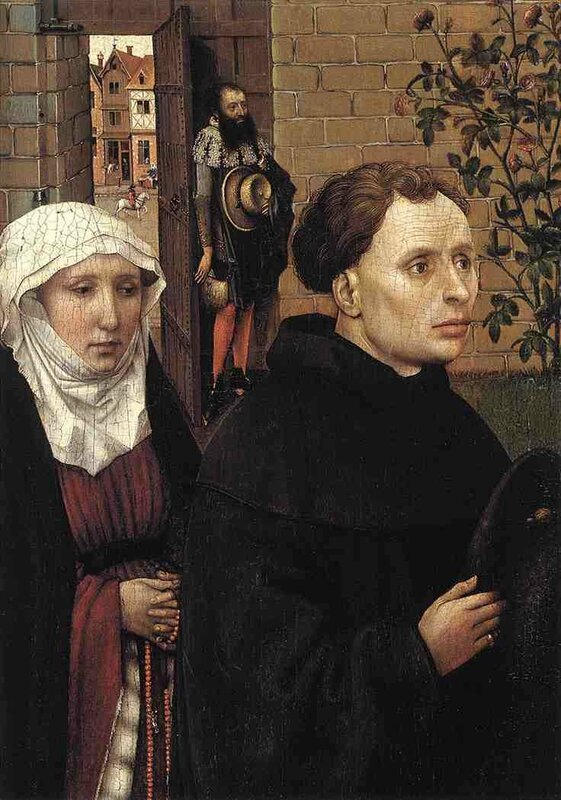 Now look at the left hand panel of this triptych and we see a man and a woman kneeling down in prayer. It is generally agreed that the man is the person who commissioned Campin to produce the work and the lady next to him is his new wife, so new that it is thought she was added later. – but who are they? The answer seems to come from various clues dotted around the triptych. If you look back at the central panel and the transom of the left hand window at the back of the room you will see a coat of arms. This was the coat of arms of the Engelbrecht or Ingelbrecht family of Mechelen who according to records were living in Tournai at the time the altarpiece was being painted and the man was Jan Engelbrecht, a wealthy and prosperous businessman. 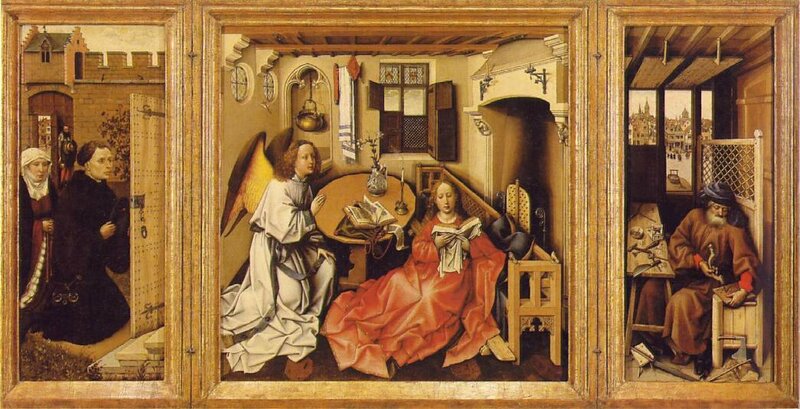 The painting is thought to have been a wedding gift for his wife and one reason why he commissioned a depiction of the Annunciation could be because of the family name Engelbrecht which translated means “angel brings”. Behind the couple we see a man wearing a straw hat. He is wearing the badge of Mechelen and is believed to be a Mechelen town messenger. In the right-hand panel, we see Saint Joseph, who we know was a carpenter. Again, like the central panel, there is an air of domesticity about the depiction with Joseph busying himself with his carpentry. He sits at his bench busily drilling holes in a piece of wood. On the table next to him we see all the tools of his trade. Art historians believe each has its own symbolic meaning – the saw refers to the implement that St Peter used to cut off the ear of Malchus, during Christ’s betrayal and arrest; the log alludes to the cross of the crucifixion; the nails, hammers, chisels, pliers and screwdrivers are all likely references to the instruments of the Passion. In my last blog I looked at some works by Joachim Patinir in which he combined biblical scenes with landscapes and townscapes but for Patinir the landscape was the most important part of the depiction. Look now how Campin has in some way combined a small townscape with this religious work. Look at the scene as seen through the window behind Saint Joseph. 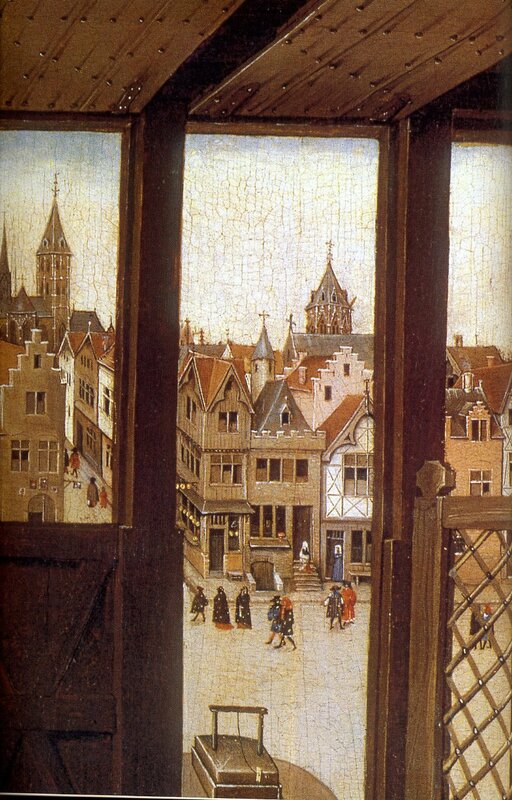 The window of Joseph’s workshop overlooks a city square around which are various houses, churches and shops. This is not a depiction of a town in the Holy Land at the time of Mary but of a town in 15th century Flanders. It could be that Campin had incorporated a scene from his birthplace, Valenciennes or Tournai or possibly Mechelen, which was the town of the commissioner of this work. So that is the Annunciation triptych or the Merode Triptych and I suppose the only question you have is why “Mérode Triptych” and not The Engelbrecht Triptych? The answer to that is simple. In the nineteenth century, this altarpiece was owned by Augustine Marie Nicolette, princess van Arenberg, having been given it by her father as a wedding present when she married Charles Antoine Ghislain de Mérode.